Conferences, festivals, colloquia, and speaker series are a vital part of campus culture. 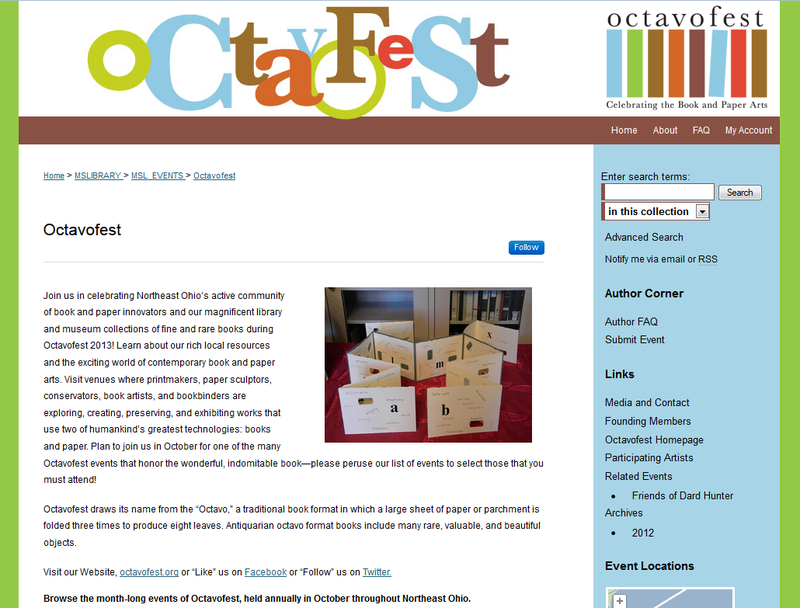 Whether the event is a community partnership, like Cleveland’s annual celebration of book arts, Octavofest, or purely campus-based, Digital Commons’ event community structure offers a number of tools to put events together easily and effectively from start to finish. The Iowa Center for Research by Undergraduates at the University of Iowa uses Digital Commons to manage electronic paper submissions, peer review, and eventual publication and archiving. As the web page explains, “the program will archive all submissions into a searchable database through the library, making every presenter and their poster a star!” Bryn Mawr College’s Women’s History in the Digital World site stores organizational and scholarly resources and allows attendees to register for the conference. The multimedia capacities available in all Digital Commons structures are showcased in Philosophical Fridays at the University of Southern Mississippi; the site captures a variety of materials related to the speaker series, including photographs, slide shows, and streaming videos. The Data Information Literacy Symposium at Purdue University collects videos of nearly all of its presentations, creating a valuable resource for both conference attendees and other potential audiences. Many schools use the structure to preserve past events; Utah State University’s Conference on University Education in Natural Resources, for example, has preserved content from its biennial conference since 2002. Like all Digital Commons structures, event communities offer a great deal of flexibility and visibility—organizers can develop separate branding, are ensured of high discoverability in Google and other search engines, and will receive usage statistics to assess the impact of their event. To further explore the numerous ways schools have used Digital Commons to support conferences and events, check out our events community reference guide and talk to your Consulting Services Representative.